The overarching theme of outrage has become more present in the United States in more ways than one in the last few years. It’s seen in newspaper articles, displayed on television programs and heard in music. 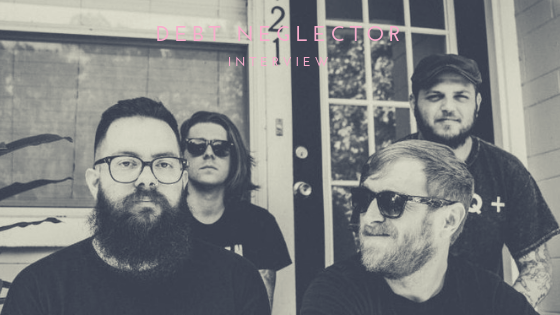 Orlando punk band Debt Neglector is no stranger to the theme of outrage. Their debut release, Atomicland, was very “going to hell in a handbasket” according to Alex Goldfarb. This time around, they wanted to talk about the negative while bringing out the positive. Like many, the band was deeply affected by the political climate and was in the studio watching everything happen in real time. They watched as a former reality show host was elected as president. They watched children bring guns to school and harm other children. They watched natural disasters damage the lives of many. As they watched all of this, they knew they had to say something. What impacted them the most was the shooting at Marjory Stoneman Douglas High School in Parkland, Florida on February 14, 2018. As Florida natives, this was the second gun-related violence they had in their home state in the last few years. It was something - and still is something - that they can’t believe has continues to happen in this country. The Kids Are Pissed EP still has a lot of negativity that Atomicland started, only this time it’s much more about the braveness that has come from the aftermath of the disaster. There’s a hopefulness to the EP, which is a contrast from their first release. It’s the kind of music that speaks beyond love and loss, but speaks to communities about coming together and creating change. As they watch these kids spark change, they want to help in ways generations before them did not.